Please join us on for the 2018 edition of our annual Women’s Voices series. 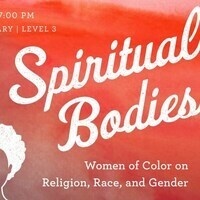 This year, we will explore the lives and personal narratives of contemporary women in religion. Tracy Tiemeier, Associate Professor of Theological Studies, will set the stage for five diverse women’s voices that will be performed by LMU Theatre Arts students through dramatic reading. Student performances are directed by Kevin Wetmore, Professor and Chair of Theatre Arts. The event is free and open to all. Light refreshments will be served. This event will celebrate women of color as resilient, creative, and powerfully embodied voices for spirituality and justice. Women of color find themselves sexualized, racialized, fetishized, and demonized. And yet they embrace their bodies--along with the many marks they bear--as revelatory of the sacred and divine. These women are Black, Arab, Buddhist, Queer, Christian, Asian, Muslim, Latina, Bipolar, Buddhist-Christian, and so much more. Listen to these women share their stories of faith and offer new ways of imagining the ultimate in the midst of the many complicated realities of contemporary life.